Seamus Whelan is a Registered Nurse and sits on the Board of Directors for the Massachusetts Nurses Association. He writes this article in a personal capacity. For the last 20 years, nurses in Massachusetts hospitals have highlighted the problems of chronic understaffing with too few nurses taking care of too many acutely ill patients. The $28 billion hospital industry has fought nurses’ attempts to win safe staffing ratios through the Democratic Party dominated state legislature over this same period. This fight culminated in a battle over a ballot measure this year between tens of thousands of Massachusetts’ nurses and the titanic hospital industry. 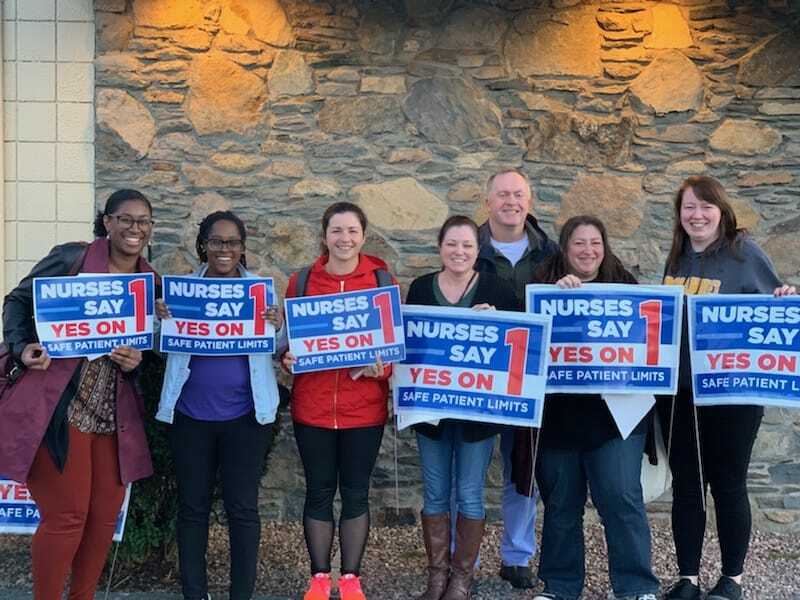 The defeat of the ballot measure by a 70-30 margin and the victory claimed by the hospital executives has provoked much discussion over why this common-sense idea of more nurses leading to better patient outcomes was rejected by voters. The hospital industry backed “No” campaign outspent the union backed “Yes” campaign by almost a 3-to-1 margin, spending at least $30 million, bombarding the public with an endless stream of misleading TV adverts and other media propaganda. Their campaign took on the appearance of a vicious anti-union drive by using intimidation, threats, fear, and confusion as their primary weapons. Nursing executives disguising themselves as bedsides nurses in scrubs appeared on our screen in these same ads crying about the chaos that would result with hospital closures, job losses, and cuts in services and programs if this measure was passed. These fear tactics proved to be successful even though a majority of voters were supportive of nurses and liked the idea of better staffing. They unfortunately were bullied and intimidated into voting against their interests. It is important that the MNA and all health care providers and health care recipients draw the correct lessons from this bitter defeat because the lack of safe staffing will continue to cause harm and suffering to those who need care. Corporate controlled health care will move ahead with developing their plans to empty out hospitals of many of its skilled nurses and health care providers and replacing them with new technology, electronic monitoring, and lower-waged unlicensed personnel. They expect these measures will increase their profits and we expect health care outcomes will worsen. The MNA’s Yes on 1 campaign failed to mobilize and activate enough of our membership to counteract the onslaught of propaganda from the hospital CEOs. The forces needed to facilitate repeated one on one discussions in workplaces and communities throughout the state were not assembled to the degree needed. The campaign’s heavy emphasis on lobbying Democratic Party politicians and officials won only lukewarm support from establishment Democrats and few resources for the initiative. More committed and healthier allies were found in the labor movement although more rank and file outreach would have been worthwhile. Boston and Worcester Socialist Alternative, Democratic Socialists of America, Our Revolution, and other community and activist organizations were a vibrant part of the campaign. Socialist Alternative organized two public meetings in Worcester and actively participated in phone banking, door to door canvassing, and stand outs in many communities. A bigger army of mobilized MNA members and other committed activists could have better countered the numerous lies, wild exaggerations, and claims of dire consequences of this initiative from the hospital executives. The truth that hospitals could easily afford to pay for safe staffing but choose instead to hoard billions in offshore accounts, in worldwide hospital real estate speculation, and in unnecessary costly mergers and capital expenditures could have been more forcefully explained. The multi-million CEO salaries and their yearly double-digit percentage pay bonuses could have been emphasized more to those low-waged workers and their families struggling to survive in the same economy. Nurses are angry and not in the mood for making up with their hospital executives who now remove their campaign scrubs and stethoscopes and put back on their suits and return to the bubble of their executive suite offices. We continue to care as best we can for our patients and cope with the resulting workplace injuries, stress, and burnout caused by the staffing crisis. MNA has pledged to continue to seek ways to continue the battle and not wait for the next opportunity for a new ballot initiative which would be in 2024. Efforts to mobilize members and community support need to start immediately with job actions and strike action considered when useful. MNA should support and help run independent non-corporate funded electoral campaigns against those politicians who support the agenda and receive the financial backing of corporate health care as a step toward building a new party of the 99%.